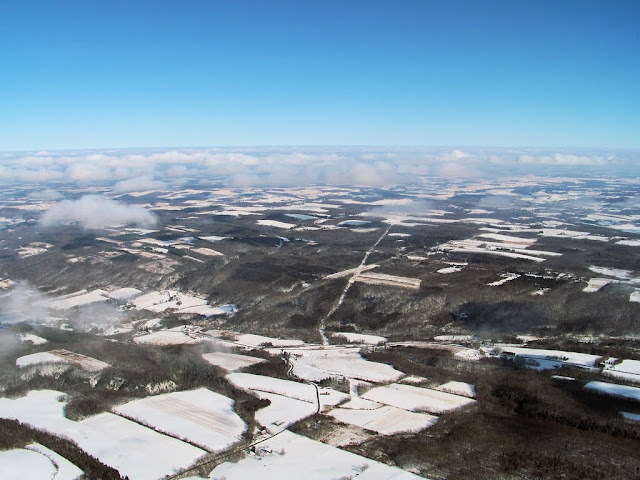 In upstate NY, winter flying often needs to be opportunistic. We awoke with no plans to fly given an uninspiring forecast for broken clouds at 2500 feet for most of the day. Instead, freshly fallen snow twinkled under brilliant sunlight from a clear blue sky. The Bear and I gathered our things and made a beeline for the airport. 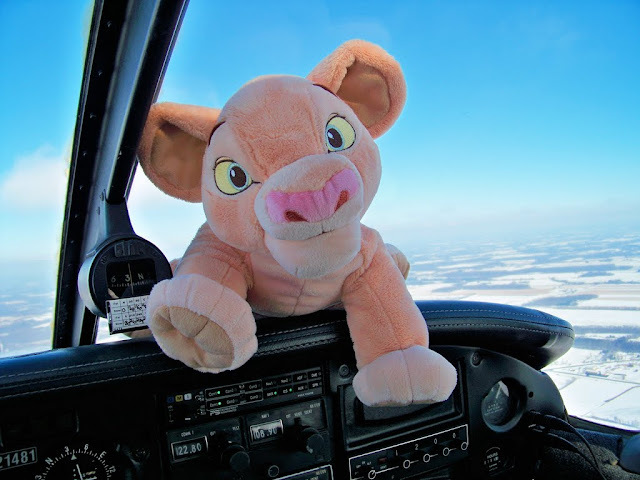 For this flight, "Nala" (Lion King aficionados will know of whom I speak - thanks, Aunt Lisa!) was coming along with us for her first airplane ride. We arrived at the Le Roy airport to find it covered in a pristine blanket of powdery snow about one and a half inches deep. And so The Bear launched from a snow-covered runway for the first time. Looking back toward the tail during run-up, she marveled at the miniature blizzard created by our airplane. 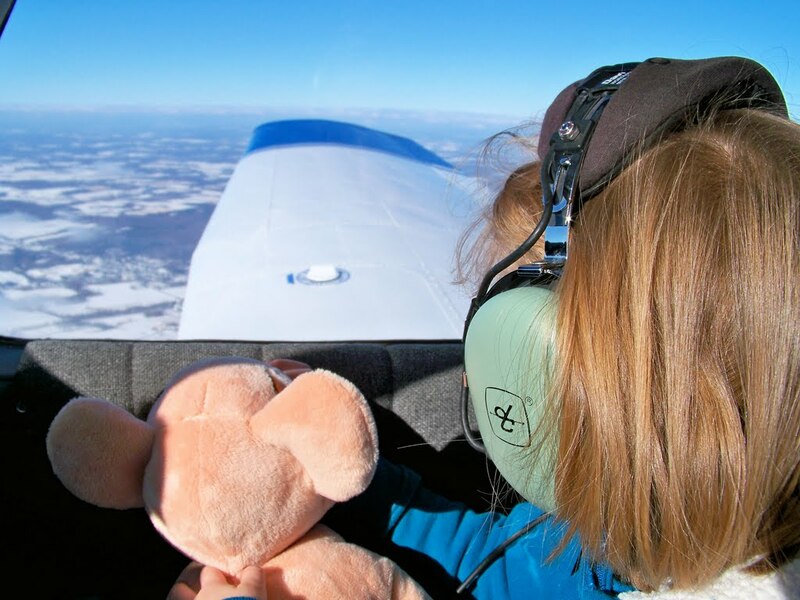 With The Bear along for the ride, my goals were to circulate some warm oil and perform some take offs and landings to stave off the inevitable winter rust from both engine and pilot. On a slightly tangential note (that will make more sense in a moment), my new year's resolution for 2012 is to begin instrument training. The current plan includes self study with help from John and Martha King (in progress! ), an avionics upgrade centered around a used Garmin 430W (scheduled! ), and finding a CFII for lessons beginning late spring (pending). I am enjoying the King IFR course. I will confess to being surprised when the course began with low altitude en route charts, but quickly realized that this was a rather clever way to introduce the vocabulary of the IFR environment. Much like when I took a Biochemistry minor in graduate school, I soon realized that the concepts are not particularly difficult once you speak the language. As The Bear and I approached Genesee County Airport for a touch and go this morning, I accessed the plate for the ILS runway 28 approach on my iFly 700 and dialed the localizer frequency into the #1 nav radio. A month ago, I would not have known where to find that frequency or, frankly, what to do with it. Alone in the pattern, I extended the downwind leg somewhat. On final and lined up with the runway, I glanced down to see that we had intercepted the localizer. Obviously, The Bear is not a safety pilot; I kept my eyes outside and occasionally checked the instruments. To her credit, however, she called traffic to me twice this morning. In both instances, they were airliners up in the flight levels. The first time I checked, we were slightly left of the localizer and high on the glideslope. The latter did not come as a surprise; I've always favored flying a steeper approach than a 3 degree glideslope. With a couple of minor corrections, I was right on the beam. Though I suspect that the process is more challenging without visual contact with the runway, it was still something of a first. To keep The Bear interested, we did some steep turns at 4500 feet over a scattered cloud layer. For each turn, completion of 360 degrees was punctuated with a crisp bump as we crossed back through our own wake. We landed at the Perry-Warsaw airport in a brisk crosswind (there is always a crosswind at Perry-Warsaw) and thus added a new location to The Bear's list of visited airports. From there, we turned back toward Le Roy. From 15 miles out, I could easily see the two small water towers bracketing town. As I adjusted our heading, I asked The Bear if she was enjoying her flight. "Did you like taking off on snow?" "That was so cool!" Then, "Daddy? I don't think Nala is having a good flight. 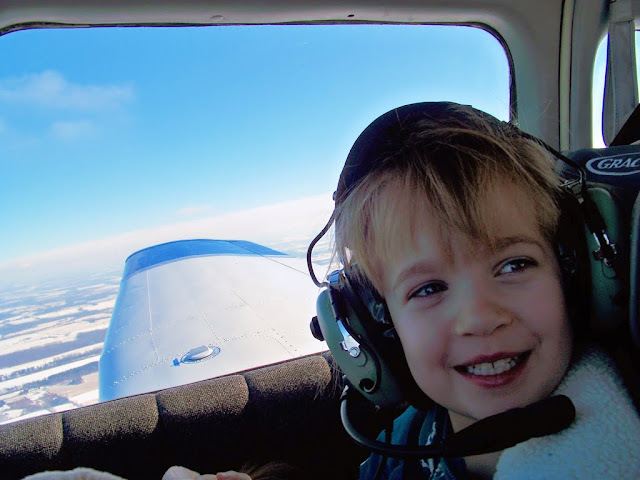 We'll have to take her flying more times until she likes it." So Nala got her picture taken on the glareshield. Hopefully, this helped her enjoy the experience more. Considering the huge blind spot she created, her position there was extremely short lived. Ten miles out from Le Roy, The Bear invoked her new favorite brand of goofiness. "Who's there?" I said with enthusiasm while groaning inside. I have never read any early childhood development books, but suspect that there must be a phase of development at this age characterized by an unusual fascination with knock knock jokes. "Interrupting cow, w..." I responded, feigning ignorance about what was to follow. "MOO!" The Bear interrupted, then burst into a fit of giggles. Over time, I have learned not to say "interrupting cow, who?" too quickly lest I ruin the joke. "Interrupting Buddy...'I have a hypothesis!'" Mine, from Dinosaur Train. "Interrupting gamelan...ding, da-ding, da-ding, ding!" Mine. I am pleased to note that my budding ethnomusicologist daughter actually got the joke. When I tried, "interrupting air traffic controller," The Bear responded with, "interrupting...I can't say that!" This was far funnier than my planned, "clear to land, runway 28" punchline. Ok. So maybe you had to be there to find all this amusing. Regardless, The Bear has been trying (and largely failing) to recreate this moment of hilarity for the last several days. Ten miles southwest of Le Roy, she was inspired again. "Interrupting animal," she responded over the Warrior's intercom. "Interrupting anima..." I began, not quite sure where she was going. "SORRY!" she bellowed in a rough voice that was a near perfect imitation of the Electric Mayhem's Muppet drummer. It was her favorite quote from The Muppets, which she saw during her first trip to a movie theater over Christmas vacation. Not bad; it was not so long ago that her invented jokes made absolutely no sense at all. I was still laughing as I keyed the mic to announce five miles out for landing on runway 28 at Le Roy. Though Ray had started plowing the apron areas, the runway was completely undisturbed except for tracks from our earlier take-offs and landings. 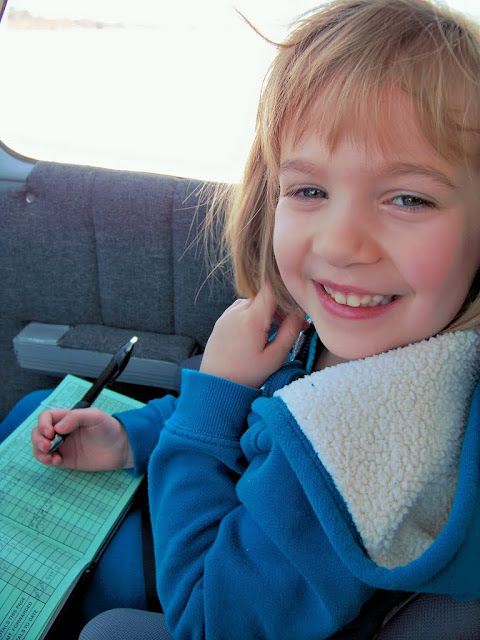 While taxiing from the runway, The Bear asked if she could write her name in my logbook for today's flight. With the airplane stopped outside our hangar, we remained in the warm cockpit tidying up and filling out the logbook. When she finished writing her name in my logbook, I noticed that The Bear looked a little worn out. We were overdue for lunch and it was close to her usual nap time. "Are you tired?" I asked. "I'm so exhausted," she answered with more world-weariness than I would have ever imagined a four year old able to muster. I expedited our departure from the airport as much as possible and took her directly to her favorite restaurant for lunch. All in all, a nice flight; quality time with The Bear and some firsts for both of us. As I edge closer to the eight year anniversary of buying Warrior 481, I am glad to find that the entire venture remains rewarding. I have spent many days over the last few weeks hoping to fly. Rochester has been obscured by clouds for much of that time, clearing only in deference to extreme winds. Finally, the air calmed, the veil of scud retreated southward, and I took to the sky. Regardless of what the calendar indicates, we lack one of the key ingredients of a typical Upstate winter (hint: it's awfully brown down there). I particularly like the little white polka-dots of snow denoting sand traps at the Davis Countryside Meadows golf course in the photo above (bottom of frame, center). Terrain around the Finger Lakes still harbored some cumulus as seen in these photos of Conesus Lake. The veil thickened over Hemlock Lake and, further to the southeast, it was obviously snowing. I liked the pattern here and how a light dusting of winter competed with a green specter of summer. A denser ceiling loomed over Dansville. As sunbeams poured through holes in the deck, they illuminated a sky teeming with high velocity motes; tiny, nearly invisible, ice crystals streaming past my aircraft windows. Staring through them with the sun at my back, the clouds beyond assumed a shimmering iridescence. The landscape reddened with the setting sun (above, near Letchworth State Park). I did some steep turns for fun. And, finally, the sun set. Darrell launched from runway 28 at Le Roy as I entered the pattern. A massive moon hung low over the Rochester skyline as I rolled the Warrior's wheels ever so gently onto the pavement. I waited an hour before returning to the sky for some night take-offs and landings at Le Roy and Genesee County. With the flying itch scratched, rust knocked off, and night currency maintained, I drove home very contented. It felt great to be back in the sky again and, though she could not say so, I think the Warrior was glad, too.